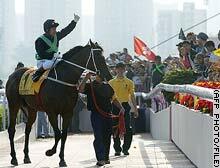 Silent Witness, seen here after one of his recent Hong Kong victories. Sea Biscuit, the American outsider that captured the heart of a nation. Red Rum, the mighty British jumper that won the grand national three times. Phar Lap, Melbourne Cup winner and icon for depression weary Australians. Now in Hong Kong, a new legend is being created. Silent Witness is a five-year-old speed machine, unconquered now in all his 16 starts. On the way he's beaten the best sprinters in the southern hemisphere and Europe. Currently rated the best sprinter in the world, Silent Witness now equals the U.S. record for the most consecutive wins, held jointly by the great Citation and Cigar. On Sunday, the horse gets the chance to break that record -- an event most punters at Hong Kong's race courses consider a fait accompli. "I can see him winning 20 times," one gambler told CNN when asked of the horse's chances in Sunday's Queen's Silver Jubilee Cup at the Sha Tin racecourse in Hong Kong. "Yeah, will definitely win again. Sure. 100 per cent," said another. It's an opinion backed up by racing veterans. "He's got all the boxes ticked. He's got all he speed, he's got tactical speed, he's got strength and the one day he should have been beaten he won on sheer courage," turf editor of the South China Morning Post, Murray Bell, told CNN. Even in training, Silent Witness competes. Trainer Tony Cruz says he has to put the horse on the track alone, otherwise he will try to race every other horse around him. So far the champion sprinter has collected $5.5 million in prize money and put many times more than that in fans' pockets. Hong Kongers are nothing if not focused when it comes to money-making opportunities. Silent Witness is now so heavily backed that the jockey club, which controls all the betting in Hong Kong, loses about half a million dollars every time he races. Bu to achieve true legendary status, a horse has to capture the heart as well as the wallet -- a feat Silent Witness is also well on the way to achieving. A Web site for the horse gets several thousand hits a week, merchandising is starting to take off and there's even a fan club that turns up each race day. Silent Witness's owner, Archie De Silva has a theory on why his mount is so popular. "They identify with him because, you see, Hong Kong has been having a few years' downturn," he says. "When you suddenly get a champion, and he's a world champion, you feel good. You know it puts Hong Kong back on top of the pedestal again." Visita a Hong Kong con fechas..